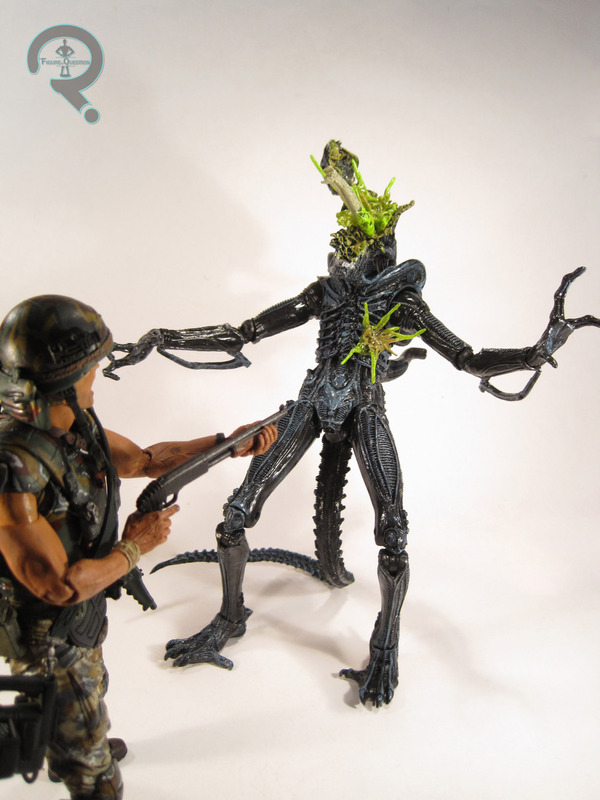 Today I’ll be wrapping up my reviews of NECA’s Aliens line up to this point. Fear not, though, as the second series and a two pack of Hudson and a Xenomorph Warrior should be on their way pretty soon. So, that’ll be plenty of new reviews. I’m looking at another of the two-packs NECA released to keep the line going. 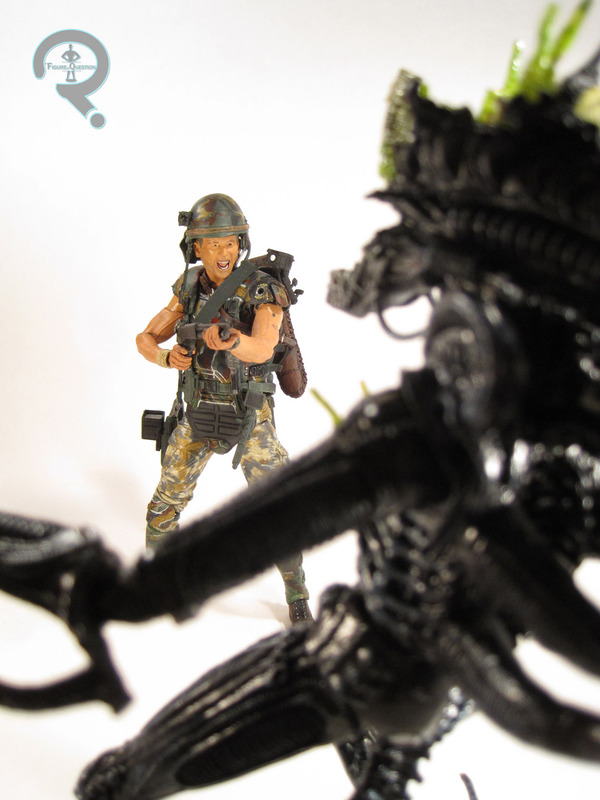 This time it’s another figure of Corporal Hicks, facing off against and unfortunate Xenomorph. These two were released as one of the three two-packs put out to bridge the gap between the first and second series. This one is just now hitting stores, so it should be relatively easy to find. First up, it’s the heroic Corporal Dwayne Hicks! Hicks is based on the character’s appearance while in the depths of the alien hive, during the initial Xenomorph attack. The key difference between this figure and the last one is the presence of his helmet, which he loses shortly after the battle in the hive, and his shoulder lamp, which was inexplicably absent from the initial release. Hicks, like his previous figure, stands about 7 inches tall and has 30 points of articulation. From the neck down, this figure is 100% reuse from the previous Hicks. If you want the rundown, go here. The head and helmet are the new pieces here. The helmet is a welcome addition, as it was very obviously missing from both series 1 marines. The helmet itself looks pretty good, but I feel it sits up too high on the head, which looks a bit silly. Since the helmet’s already non-removable, NECA probably should have foregone the top of the hair entirely to allow the helmet to sit more naturally. The head itself is fine, but the choice of expression. While the screaming head is a fine choice for the upcoming Hudson figure, it doesn’t really fit Hicks, who’s only really seen screaming once in the film (Upon seeing the aliens in the air ducts, for those who are curious) and it’s about an hour after he’s lost the helmet. Regardless, it’s a decent sculpt, and it does actually have a semi-decent likeness, even if it is an odd expression. The paint seems to have a bit of a step down from the regular release, with a lot more noticeable slop, and a large black spot on my figure’s left shoulder, which is quite annoying. Hicks is accessorized with his shotgun and appropriate holster, a pulse rifle, a welding torch, a shoulder lamp and a motion tracker. Next, it’s the Xenomorph Warrior. Now with more exploding! Remember the other three Xenos I looked at? Yep, this one’s pretty much the same, but with two new pieces, one of which does cost the figure 2 points of articulation. Similar to Hicks, the Xeno is practically the same as the series 1 version from the neck down. One small difference is the addition of a bullet hit on the upper torso, however, this looks to just be an additional piece glued in place. The biggest difference, of course, is the head. It’s sculpted to look like the alien just took something to the face, presumably a shot from Hicks’ shotgun. It’s in the process of splattering acid blood everywhere, which is conveyed using translucent green plastic. It’s a nice touch, and it looks really cool when set up properly. The paint on this figure’s actually different than we’ve seen on any of the previous aliens. This is our first glimpse at the film-lighting inspired blue accents, which will see a proper release on series 2’s Xenomorph Warrior. Having seen the three options in person, blue may well be my favorite, but I’ll hold final judgment until I get the proper blue version in series 2. Thankfully, the paint work here is much better than the series 1 Xeno, which is certainly a good thing. Here’s hoping the rest of the Xenos continue the trend. Like the previous two-pack, I had not intended to pick this one up, but I saw a lone set at my TRU (I’m starting to think my TRU is just ordering a single one of each of these to lure me in), so I picked it up. While I don’t feel it’s as good a set as the Genocide set due to a few quality issues, it’s pretty fun. If you’ve yet to get Hicks, or you prefer he have his helmet, this might be the set for you. Otherwise, it’s kind of the type of thing that only completists really pick up. And apparently I’m a completist now. Yay. 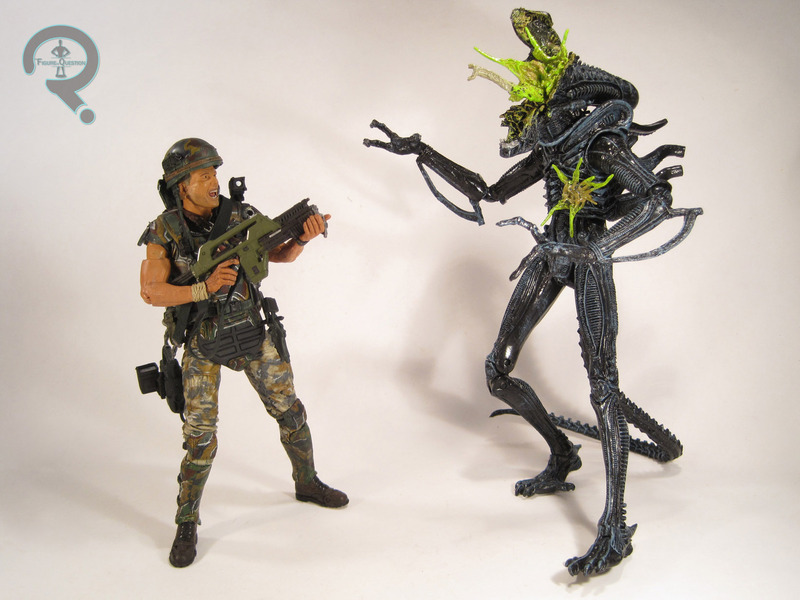 *Want to buy a Hicks vs. Xenomorph of your very own? Our sponsors over at All Time Toys currently have this set in-stock. Click here to check it out!